Removing waste safely is the third highest priority Healthy Living Practice. Toilets are easily understood but how to treat waste to make it safe is much more confusing. 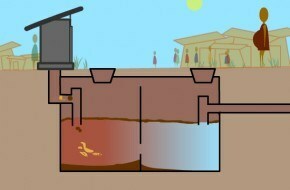 This animation of a septic tank treating human waste safely was originally developed to explain to Nepalese families and building teams how the process of breaking down waste works and the time this process takes (note the lady in the brown dress). It has been viewed by over 200,000 people around the world including tradespeople and design professionals.